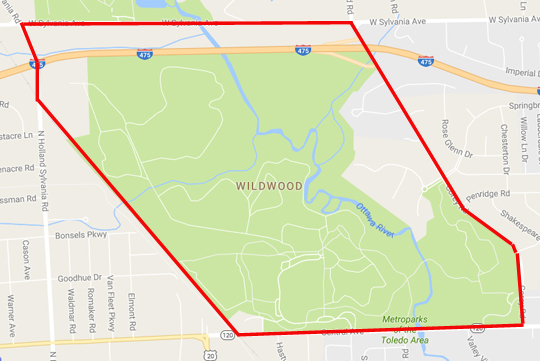 In early 1975 I moved from the cozy Old Orchard neighborhood to the general vicinity of Corey Woods, a half-Toledo, half-Sylvania Township neighborhood of big yards and ranch houses roughly bounded by Talmadge Road, W. Central Avenue, Corey Road and Interstate 475. My subdivision was the less-haughty Haughton Acres. Right away, the new kids were made aware there was a very cool place nearby, on the other side of Corey Road extending all the way to the railroad tracks near Reynolds Road, shrouded in mystery and, as I look back on it, danger: the Stranahan Estate. We learned to find the right trails and cross the Ottawa River over some fallen trees, and how to eventually wind up at the estate, with its crumbling buildings, the empty swimming pool, the stables, the garages: all the dilapidated trappings of luxury. 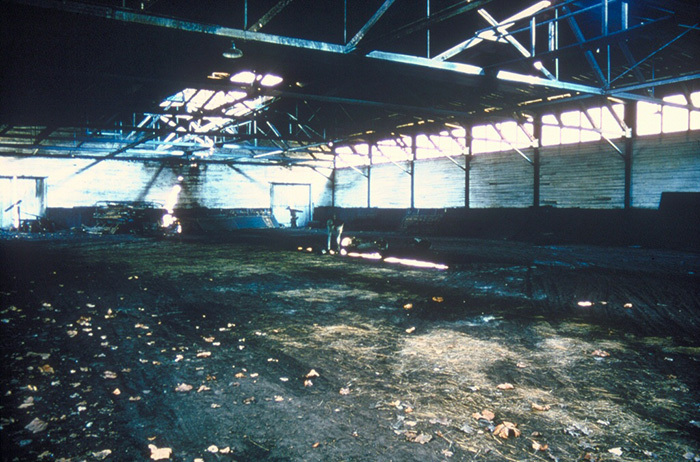 There was the now-demolished riding arena. And the pool, which was eventually filled in (the former bath houses remain). 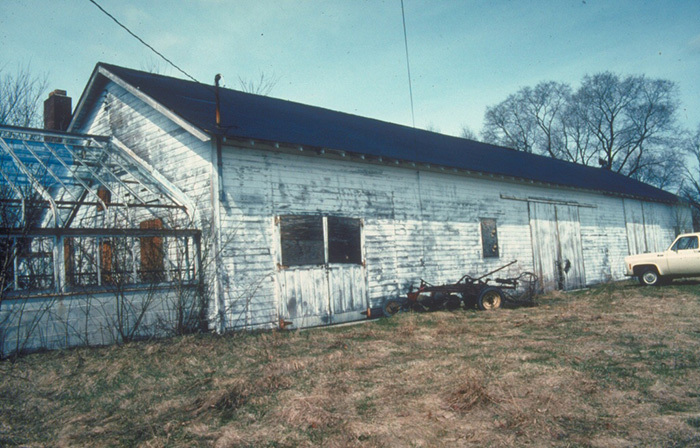 And the greenhouse (also now demolished). I never did set foot inside the estate, at 5120 W. Central Ave., but the house had apparently been violated at some point, since others more bold than myself reported a bowling alley and an indoor shooting range inside the house. The mansion’s namesake was Robert A. Stranahan Sr., who moved his fledgling spark plug company to Toledo in 1910 to become the nationally-known Champion Spark Plug Co. He died in February, 1962. 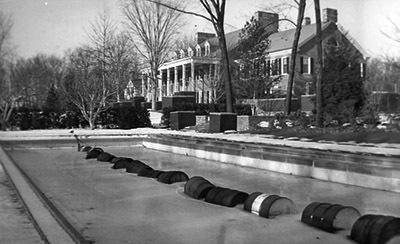 Stranahan’s wife was the last person to occupy the mansion (she died in 1968) and according to The Blade the mansion had been “unoccupied for several years” since then. 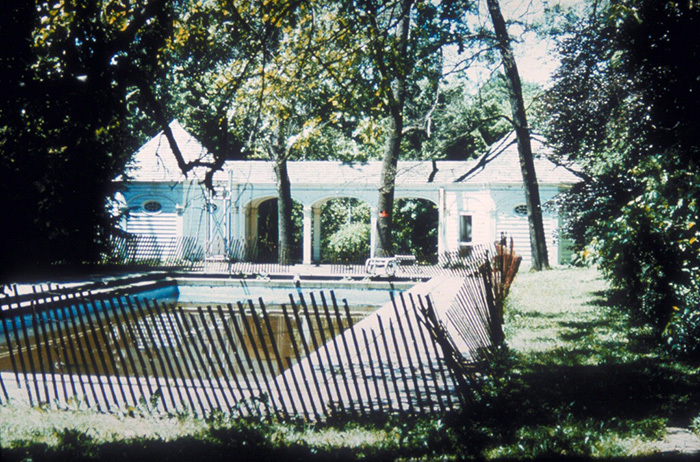 The land sat until September 1973, when developer Robert Cavalear announced he had acquired an option to buy the 465-acre property for about $4 million and develop it into a “modern-day Ottawa Hills” with a thousand homes in seven years. The story linked above brought out some interesting facts about the land. Stranahan bought it from another Toledo industrialist, Thomas A. DeVilbiss. Development of the estate began in 1936, and the plot of land itself was once much larger. Stranahan donated land to the Sylvania City School district for Stranahan Elementary School on Holland-Sylvania Road (which I attended for a grade and a half), and there was the Chatham Valley subdivision built off Corey Road. Another 41 acres was lost when the State of Ohio acquired land for the construction of Interstate 475 in 1965. Maybe the most interesting fact was that Stranahan, in landscaping the property, changed the course of the Ottawa River to be closer to the house. The original Stranahan Estate outlined in red, courtesy of Google Maps. It did not take long for the suggestion that the Toledo Metropolitan Park Board purchase the property and turn it into a park. That came from Dr. William Mewborn, a Sylvania Township veterinarian, who not only pointed out the historical importance of the property, but its aesthetic value as well. Instrumental in the campaign was John Lusk, who co-chaired the Save The Stranahan Estate campaign. The Lusk-Mewborn Riverview Boardwalk at Wildwood is named in their honor. The board was cautiously optimistic, but knew there were obstacles to overcome: Who would pay for it? What about the option to buy already agreed upon? A special bond issue was needed, and that’s what happened. 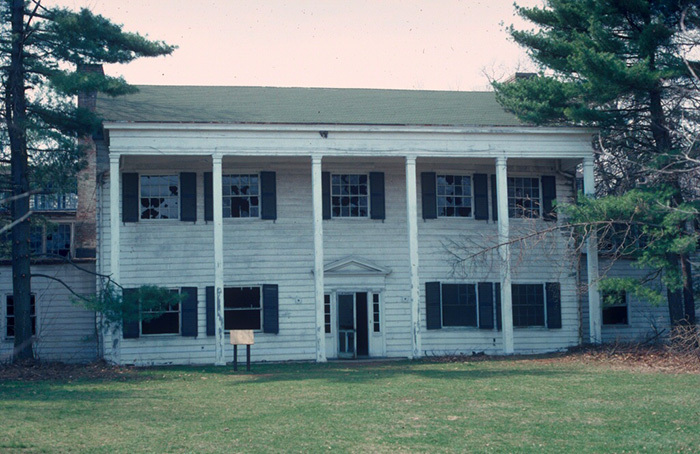 …But a more compelling case, we believe, that the community as a whole – and the generations to come – would more likely benefit if this estate were preserved as basically what it is now: A pristine parcel of lush woodlands, meadows and streams that provides a natural wildlife habitat and which could make an extraordinary attractive public park just outside Toledo’s city limits. The ballot issue came up for a vote on Tuesday, Nov. 5, 1974. Alas, pages from The Blade that day are missing, but it passed, 64,490 to 58,577. It gave the Metroparks $10 million over ten years to purchase and develop the property. About the only thing I can’t figure out was when the park actually opened. It might possibly have been in the fall of 1978, because I remember hanging out there – in the park this time – well before I finished high school (which was then, did you see me? I’m the one with the long hair). And today, it is now the Metroparks’ most-visited park. The Blade thought it was a pretty good idea at the time and said it again in this September, 2000 editorial, but mentioned something very interesting. It’s regrettable that Mr. Cavalear says he has never visited Wildwood. The noted Toledo developer, who has contributed so much to this community, is still smarting from the loss and says he has never wanted to go there. That’s a shame. A trip to Wildwood might make him realize things turned out for the best. In this short YouTube clip, historian Ted Ligibel and Mewborn discuss the campaign. And, in fact, somebody else did eventually build a “modern-day Ottawa Hills” right across the street on the site of Allie Reuben’s Hasty House Farms, Hasty Hill Farms. Great article!!! Are you a Blade writer? I am a little confused by who wrote this article. I too lived in Toledo and attended Sylvanua High.